"Lost in the USA" is about Two young Egyptian men who arrive in the US and have their identity inadvertently switched. A divorced young man happens to fall in love. The couple faces problems, as the young man does not want to settle down, she thinks he is a flirt, they break up, and events follows. Two strangers try to solve a mystery that revolves around both of their tragic pasts. At the heart of the mystery lies a mystic board with an ability to kill. 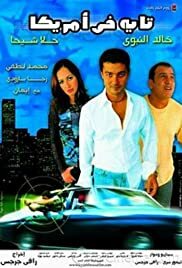 He (Sherif Mounir) returns back from Europe after inheriting his former boss, carrying the curse that killed his boss' family to his family's doorsteps. Amira falls in love with her handsome married boss , and they have to face too many challenges to make this relationship works. Adel Imam, Shirin riding the train through the fault lies in their hands bag by $ 5 million Ventzerna even ask one of them in the newspapers do not find a thing that Viorteura Iqtzma coins and coming events.